It seems that you guys joined the BOY as big fans of yesterday’s Indian-Spiced Chicken Burgers. Thanks for all of the comment love! Reading your comments is one AWESOME way to end the day! Although I have been really limiting my dairy, I have been wanting to try this new Chobani flavor. It’s one small serving and topped with KIND granola makes the perfect post run snack. Speaking of snacks…I have an awesome new no bake energy bar recipe for you! Confession: My first attempt at this recipe came from a cookbook and was a totally disaster! I don’t blame the cookbook, I blame the super soft apricots that tasted sweet like candy, but just didn’t stand up to the food processor in energy bars. So I had to trash version one and start from scratch on my own version. I was inspired by this dried coconut that we picked up at Costco yesterday. This brand makes the most amazing dried mango EVER, and so the BOY and I were excited to try this stuff too. For the nuts, I chose a blend of almonds and walnuts because I had both in the house, and because I love the flavor combination that they create with the dates. You do have to be patient because it takes a few minutes to break everything down and blend it together. If you are having trouble getting everything to stick together, you can stream in some liquid. I chose fresh squeezed orange juice, but agave or honey would work too. The last step is to simply roll the dough into balls and coat them in more coconut. Please excuse the poor lighting on these pictures. It was a dark and stormy day! But don’t let that deter you from making them! I know that when it comes to coconut, you either love it or hate it. Well not me! I used to hate the stuff, but slowly it is growing on me, and these Coconut Balls are soft, chewy, sweet, and delicious! What is your favorite coconut recipe? 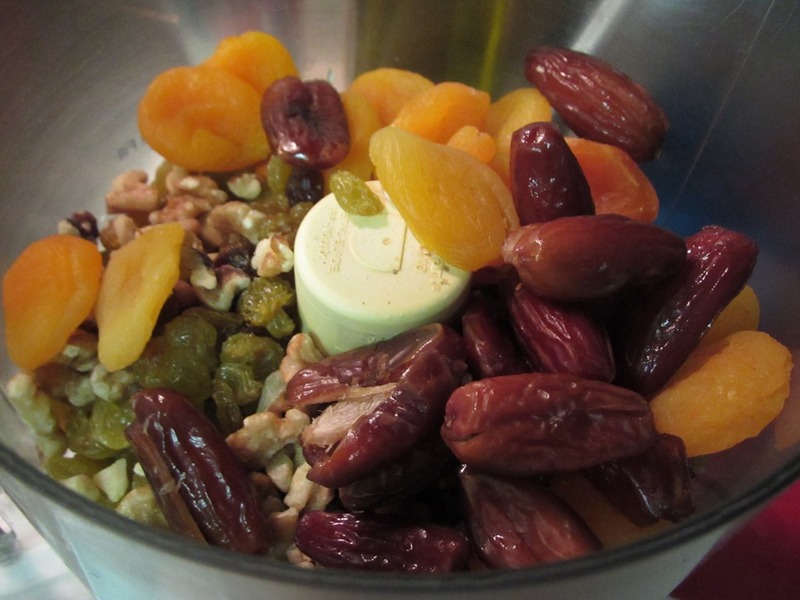 Place dates and coconuts in your food processor and blend until combined. Add nuts and blend for another few minutes until everything begins to get combined. Drizzle in 1-2 tbsp of fresh orange juice (or agave and honey) as needed to help everything blend together. For the dough into balls and roll in shredded coconut. Store in the fridge to snack on throughout the week! What are your thoughts on the Chobani bites? I just tried the Pineapple Caramel flavor and I wasn’t really into it. Maybe I need to try a chocolatey flavor. Those coconut balls look like the perfect pre-run snack. And way better than any energy bar. Isn’t it nice knowing exactly what’s in your food? Yes…because there is no added sugar or salt and the food doesn’t need it. 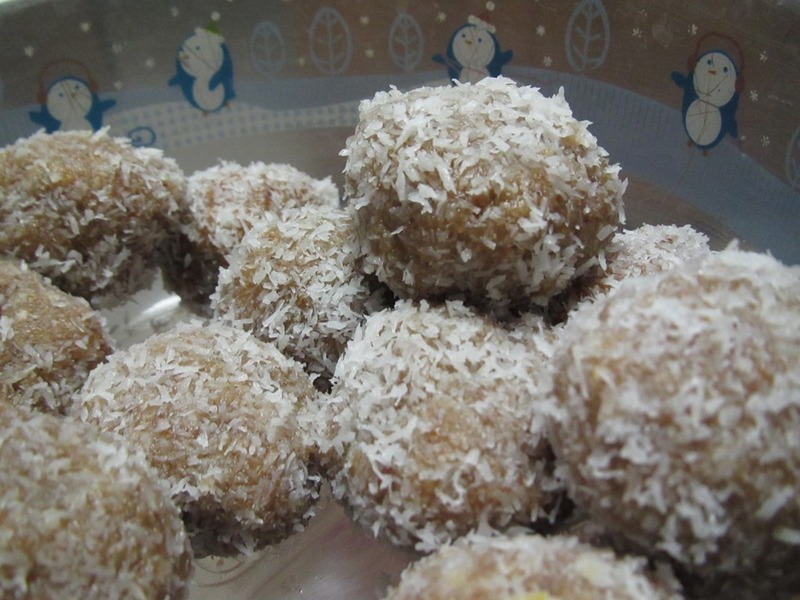 I have been snacking on the coconut balls in the later afternoon at work, which is awesome! Do you have any other running snacks that you make? I thought that the chocolate flavor was tasty but not amazing. I haven’t had yogurt in a long time so I may not be the best person to ask. But it is totally worth trying! You’ll have to let me know what you think. I love coconut . . . but haven’t always. I’ve definitely just discovered that I like it so much. These balls remind me of my favorite Coconut Larabars. Yum! I saw dried coconut at TJ’s, but didn’t buy it because of the added sugar. Did Costco’s have added sugar? I’ll have to look for it! 🙂 Have a great day! The mango and coconut have added sugar so it is best to keep them out of your pantry. I have been snacking on them all week : ) I don’t know why they add the sugar because fruit is tasty enough without it. I wonder what TJ’s has?! I’ve never tired the coconut Larabars but I bet these are similar and really good! There are so many uses for it that I am discovering each week. I will definitely be eating some macaroons next week. Hope you can find some time to make them! I really want to try those Chobani bites! The flavor combos sound so good! Your recipe for coconut balls sounds great. I am in love with anything coconut flavor, so I have a feeling these would be right up my alley! I love your balls. That is all. That is all that I needed to hear. OMG. These look incredible! I can’t get enough coconut lately! Must get to Costco to get some of that dried coconut! Do it! I have been sharing these at work and they are a huge hit! I will definitely be making another batch!